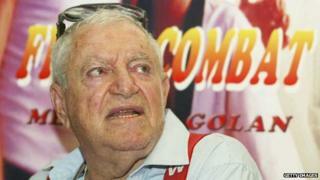 "RIP, Menahem Golan," tweeted Belgian action star Jean-Claude Van Damme. "I love you and will always do." Chuck Norris also paid tribute to the film-maker, saying Golan's "faith" in him had enabled his movie breakthrough. They included Sylvester Stallone's films Cobra and Over the Top, which Golan also directed, and four sequels to Death Wish starring Charles Bronson. Golan and Globus also produced more ambitious fare, such as Superman IV: The Quest for Peace with Christopher Reeve, a film of the Verdi opera Otello and Jean-Luc Godard's 1987 adaptation of King Lear. Known in the industry as the "Go-Go Boys", the pair co-owned Elstree Studios in Hertfordshire for a time and operated the Cannon (formerly ABC) cinema chain. Born Menahem Globus in 1929 in the former British mandate of Palestine, Golan was a pilot and bombardier in Israel's war of independence in 1948. A documentary about Cannon Films screened at this year's Cannes Film Festival, while another will have its premiere at the Toronto Film Festival next month. Golan was remembered by Israel's culture minister Limor Livnat as "a colourful and special person who will forever be remembered in Israeli culture". British film-maker Edgar Wright also paid tribute, tweeting that Golan was "no longer with us" and that the Cannon logo should be flown "at half mast". The Hollywood Reporter quoted Globus, 72, as saying he was "in complete and utter shock" and that he could not "come to grips with the news".